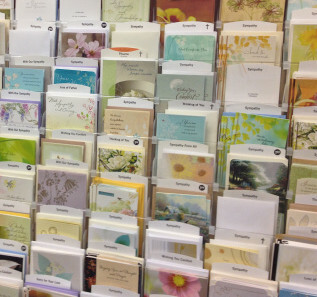 The day of Michael Brown’s funeral I stood in the bereavement card aisle. My three children danced and swirled about me pulling open cards that loudly played “We Are the Champions” or “Celebration” as I stood frozen, hands sweaty, with a card that read ‘We lost a good man’ in my hands. It was Back to School season when all children are abuzz with excitement, but all I felt in that moment was a sense of loss. It had been two days since learning of a friend’s sudden death and two weeks since Michael Brown’s shooting. Later in the car, my freshly bought bereavement card tucked safely inside its crisp paper sleeve beside me, I listened as Michael Brown’s funeral was covered on the radio. My kids were half listening as they talked quietly about what their teachers might be like, who to sit with on the bus, and what to pack for lunch on the first day of school, pausing for a moment or two to listen to the interviews. They didn’t ask about whom the commentators were talking – they knew. They knew who Michael Brown was because the day after the shooting we sat down and talked with them about it. We talked first because we knew they would hear about the shooting from others in our community, at church, and in the media. We talked. They asked questions. Who shot him? What did he do that was so bad that they shot their gun at him? Will the police get in trouble? How old was he? Was his mom there? One thing they grasped quickly; Michael Brown would not be returning to school like them. After explaining the complexities of what happened their questions further centered on why the police would shoot someone unarmed. They are not stupid, like every other kid in America they understand what it means when you put your empty hands in the air in surrender. It is the universal sign of stop, don’t hurt me. What would his mom do now they asked? It’s the police. What will she do? A few days later we drove into Oregon to dig Thundereggs; a long held desire of my oldest daughter. While driving we listened to Brendan Buckley’s Universe and Everything in It by Sundee Tucker Frazier. I wanted us to listen to the book for two reasons. The first was it involved exactly what we were about to do – dig for rocks and discover minerals – but mostly I wanted to listen as Brendan, the 10 year-old biracial main character and budding scientist processes his own racial identity. Frazier writes plainly about issues of race in the context of her story and would prove to be a fruitful conversation starter. I think it was mid-way in listening to the book that we turned it off in order to have a deeper conversation about being black in America. Frazier was detailing conversations between Brendan and his father about the realities of living as a black male in America; specifically how to respond and behave when police officers are present. Resonating with our recent conversations, we circled back to Michael Brown. Fiction parroted real life for our family. What Frazier writes in her novel, confirmed stories my kids have heard from friends who have been pulled over and harassed for ‘driving while black’, friends stopped and frisked for no apparent reason other than they are black, friends wrongly targeted by ‘’fitting a profile” and being hassled or excluded because of skin color. These are all things we talked openly about. I have always found it interesting that we prepare our kids for the unavoidable disasters in our world today – hurricanes, earthquakes, floods. These things are unavoidable and will happen when they happen. “Its all about preparation,” we calmly conclude. But when it comes to something we CAN avoid – like racial prejudice, racial inequality, and racial injustice in America, we can’t find the words, it isn’t on our radar, we don’t have the time. The miraculous truth is that IF we prepare our children – those that sit at our dinner table every night and look with eager minds for our words and lives to lead them in this world – IF we choose to speak, to tell the truth about race and do the hard work of understanding and advocacy… Racial prejudice, perpetuated racial inequality, intentional racial injustice becomes – avoidable. Another black boy does not have to lay dying in the street. No more condolence cards about someone leaving us too soon. More boys will go back to school and their mother’s hopes will remain intact. “Sissy is brown, do people think those things of her? Like what we heard in the book?” My son said. And that’s it isn’t it. Understanding and advocacy. It is avoidable. Let us do the laboring work today.